Agni is the most popular god of the Rigveda as is evident from the number of hymns addressed to him in the scripture. Fire is central to all vedic rituals. In terms of importance, he is next only to Indra, the Lord of the Vedic deities and Indra's heaven. All the offerings in the Vedic sacrifices are invariably offered to Agni and through him to other gods. Agni is thus the primary recipient of all Vedic sacrifices. In the body he is represented by the eyes and by the digestive fire. His importance is evident from the fact that Agni Purana is named after him. Before teh emergence of Siva as the god of Hindu trinity, Agni was the god of destruction both feared and revered by the worshippers. Symbolically he represents insatiable desire and hunger for food. As the most potent and visible form of energy, useful but destructive at the same time, he was both feared and revered by the vedic people. Almost every mandala or division of the Rigveda starts with a hymn to Agni. The vedic hymns praise him copiously often describing him as the supreme god and creator. The Upanishads describe Atman or soul as a flame of the size of a thumb. Other gods and elements such as the earth, the air are but his manifestations. He is the thunderbolt of Indra's weapon, the light of the Surya. In the later vedic period he became, one of the Ashtadikpalas as lord of the southeast quarter. Agni is the chosen Priest, God, minister of sacrifice, the hotar, who lavishes wealth and dispels the darkness. Sapient-minded priest, truthful, most gloriously great, ruler of sacrifices, guard of Law eternal, radiant One, no sacrifice is complete without his presence. His presence verily ensures the success of a sacrifice, because whatever sacrifice he accepts goes to the gods. Agni is the messenger, the herald, master of all wealth, oblation-bearer, much beloved, who brings the willing Gods from the heavens and makes them sit on the grass with him near the sacrificial altar. Agni along with Indra, the lord of the heavens and Surya, the lord of the skies, constitute the first trinity of Hinduism. Their places were latter assigned to Siva, Brahma and Vishnu respectively. In the Puranas, Agni is subordinated to other gods. We see in them a clear decline in his popularity and significance. The Agni Purana, for example, is not about the significance of Agni but of Vishnu as the lord of the universe. Agni is a mere recipient of divine knowledge like other vedic deities. It is possible that the Agni Purana we have today is not even the original Agni Purana. According to tradition Agni has ten forms, which are described below. Of these the first five are his material or natural forms and the next five his ritual forms. Fire produced using sticks for the purpose of sacrificial ritual. The fire kept in the house for domestic rituals. The southern fire of the ancestors used in certain rituals. The funeral fire used in the cremation rituals. Agni is appointed by Manu as the priest. He is often invoked along with Indra, with whom he shares the passion for soma drink. He is also invoked along with Maruts probably to ward off the dangers of forest fires. Agni, was the earliest Angiras, a Seer. After his holy ordinance the Maruts, were born with their glittering spears. 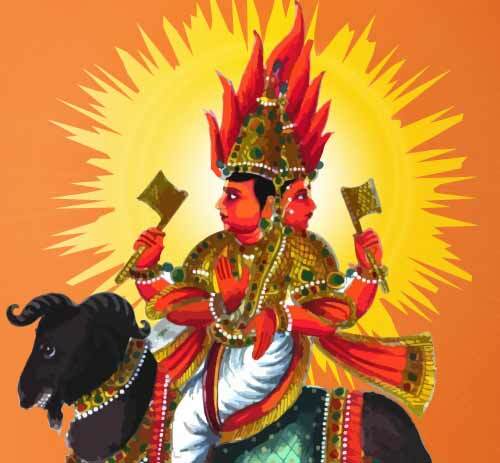 Addressed as immortal Jatavedas, many-hued effulgent gift of Dawn, bearer of offerings and the charioteer of sacrifice, Agni is the Lord of Red Steeds, who loves songs. Kind and bountiful giver of gifts, of wondrous fame, Agni is the friend of all, loved by many in their homes. The Vedic people were aware of his destructive ability, as he sets the forests aflame. "Urged by the wind he spreads through dry wood as he lists, armed with his tongues for sickles, with a mighty roar. Black is thy path, Agni, changeless, with glittering waves! when like a bull thou rushes eager to the trees, with teeth of flame, wind-driven, through the wood he speeds, triumphant like a bull among the herd of cows, with bright strength roaming to the everlasting air: things fixed, things moving quake before him as he flies." We also know some thing about his origins. Matariswan brought him down from the heavens and handed him over to the Bhrigus for keeping. In some of the hymns like the following ones, we see Agni being elevated to the status of a supreme god, " Agni is the Vaivashnara, the center of all people ... He is in the sky as well as at the center of the earth." A similar notion can be found in this hymns also. "Commingling, restless, he ascends the sky, unveiling nights and all that stands or moves, as he the sole God is preeminent in greatness among all these other Gods."